Adding to the safety of Klinge Corp’s Offshore Refrigerated Containers (designed to meet the ATEX Directive) is the DNV containers. The 10′ and 20′ DNV containers are certified to EN12079 and DNV 2.7-1. The Offshore Refrigeration Units are mounted to these containers. DNV Containers (also known as Offshore Containers) are used primarily in the oil and gas industry because of their ability to withstand the harsh environment and handling of the offshore industry. Due to the dangerous nature of the oil industry, these containers are subject to many more regulations and must undergo a strict certification process to ensure the safety of personnel working on the oil rigs, oil tankers, as well as the environment. The combination of Klinge Corp’s Offshore Refrigeration Units (ATEX Directive compliant) and DNV containers certified to EN12079 and DNV 2.7-1 makes their Offshore Refrigerated Container the ideal solution for the global offshore oil and gas industry. ISO containers feature standardized sizes and designs that expedite movement through the supply chain. Offshore containers, on the other hand, are often application-specific and produced in custom sizes to meet the requirements of a given operation. ISO and offshore containers are designed to handle different loading and unloading forces. Whereas various equipment, such as a spreader beam or crane, can be used to lift ISO containers, offshore containers are more limited. Offshore containers are designed for harsher operating conditions. Durability is the most important distinction between ISO and offshore containers, and one of the main components of DNV 2.7-1 registration. Because of their use by the oil and gas industry, offshore containers must be able to withstand exposure to harsh chemicals and extreme environmental conditions. Specific types of offshore containers governed by DNV 2.7-1 include freight containers for transporting cargo, service containers engineered for a specific process or application, and waste skips. The process for certifying an offshore container to DNV 2.7-1 standards involves multiple steps. Because these containers come in many different sizes and configurations, each certification is unique and begins with a thorough design appraisal. This appraisal will look at various aspects of a container’s design, including its dimensions, load ratings, welding methods, sealant materials, and other specifications that affect its performance. Then, a survey is completed during manufacturing to ensure appropriately qualified workers are performing all processes as specified. The last stage involves a final inspection of the prototype to confirm its compliance with the initial blueprints. As well, the auditor will perform a series of lift, tilt, and impact tests at this time. Why Is DNV 2.7-1 Certification Important? The certification process for a DNV 2.7-1 compliant container is long and thorough. Attaining certification lets you know that a manufacturer is committed to quality control and reliable products. When it comes to the world of offshore shipping, these commitments can mean the difference between safe working conditions and a potentially damaging accident. 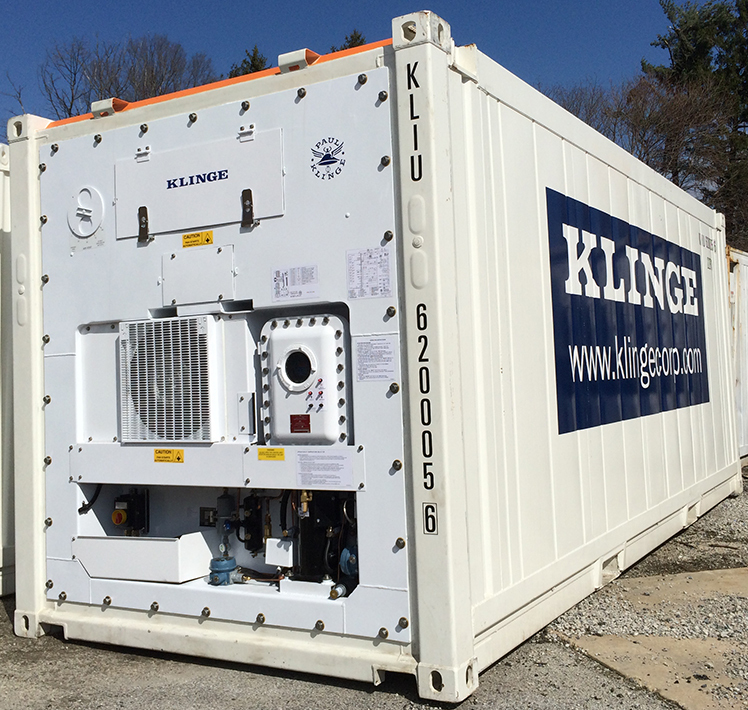 Klinge Corporation DNV 2.7-1 certified containers offer the peace of mind you need to take on the most demanding task. We also offer ATEX-certified explosion-proof products and can customize our designs to reflect your specific needs. Explore our full lineup of products and capabilities by browsing our website. Contact a Klinge Group Specialist to learn more! DNV Offshore Container. It is challenging to avoid accidental gas leaks on oil rigs. To address this major safety concern, Klinge Corporation has designed a Hazardous Zone 1 and Zone 2 explosion-proof refrigeration unit for shipping containers.